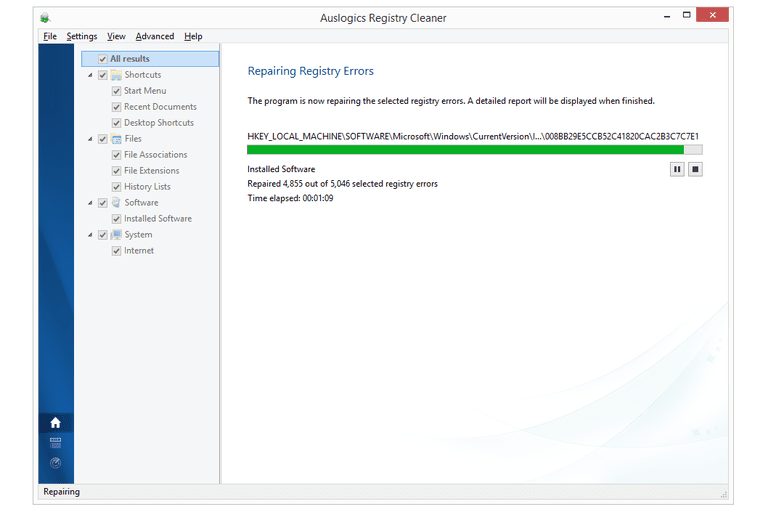 Auslogics Registry Cleaner is a free registry cleaner for Windows that includes automatic registry backups and a 1-click cleaning button. The program is easy to use, has very little settings, and includes a nicely formatted report of what Auslogics Registry Cleaner fixed. This review is of Auslogics Registry Cleaner version 7.0.24.0, released on March 26, 2019. Please let me know if there's a newer version I need to review. First and foremost, I like that a "Scan and Repair" button is included because it allows for a 1-click clean of the registry, which some registry cleaning programs don't include. This button is revealed only if you click the arrow next to Scan Now. I also appreciate the automatic registry backups because a vast majority of people would surely forget to make a backup if it weren't built into the program. Before starting the install of this registry cleaner, setup might try to get you to install one or more other programs from Auslogics, but you can simply skip those offers to stop them from installing. It's possible an additional program will also try to install once the registry cleaner has been installed, but you can easily decline this one as well if you don't want it.